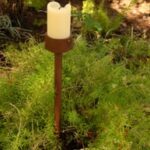 Expert ideas for using string lights, lanterns, pendants, pathway lights, and other forms of outdoor lighting to light your garden areas with style and beauty! Similar to their indoor relatives, outdoor lighting solutions can be mixed and matched to complement your personal style. Whether you’re hosting a daytime gathering, putting the landscape on display under the stars, or simply showing concern for the safety of visitors, a few well-placed lights can make all the difference. 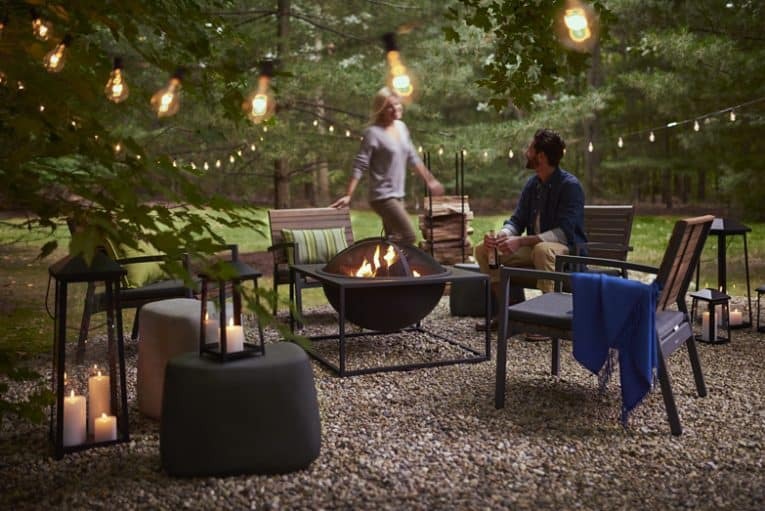 From lanterns to string lights to candles, here are the lights you need to turn your backyard into the perfect space at any time of day. String lights are an easy way to create a soothing, ambient glow. Whether you’re preparing a romantic outdoor meal for two or hosting a big bash, these gleaming strands tie the desired aesthetic together. Keep it simple for small gatherings by outlining the edge of a patio or balcony with a single strand. This subtle lighting solution minimizes distraction while providing a soft luminescence that puts all the focus on your delicious homemade meal. For a large cookout in a sprawling backyard, hang multiple strands in parallel lines overhead. To do this, make use of telescoping light strand poles or hang from trees to incorporate the landscape. Don’t forego this idea because of a rainy day. Improvise by hanging string lights under a canopy. Want to concentrate light in a single spot? Consider affixing string lights to a patio umbrella. Want more mobility with your lighting? Opt for lanterns or hurricanes. Place them throughout the backyard, highlighting your path to mingle at the outdoor bar, then progress to the grilled buffet and finally to lounge in a chair by the pool. 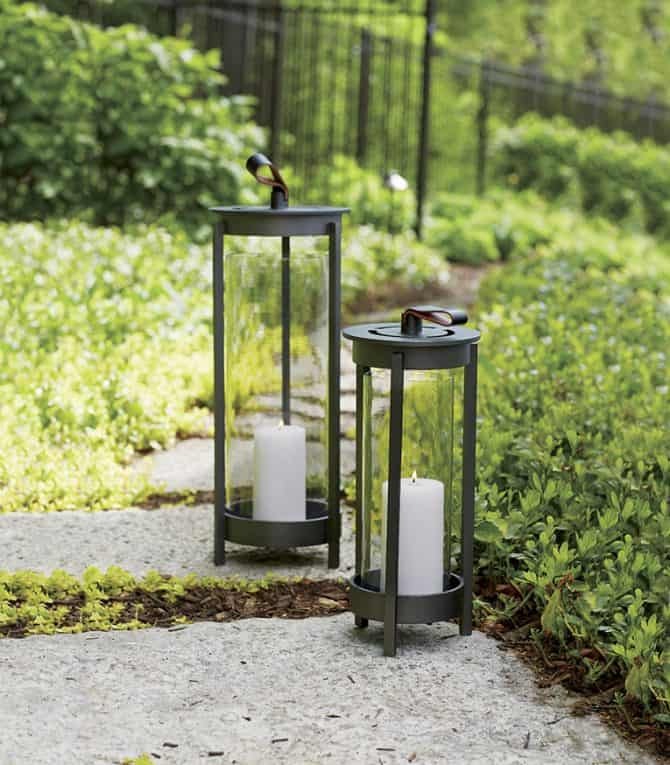 Outdoor lanterns invite guests with warmth and style. Add an atmospheric touch to an alfresco setup with a small lantern in the center of the table. Use it on its own or surround the small lantern with slightly bigger accent lanterns or hurricanes at a rectangular dining table. Place them on top of a runner, and then accentuate each with faux berry wreaths. As an alternative, fill the interior with pebbles, seashells, or realistic greenery. For a different look, place one or two lanterns on the side table next to a wicker sofa. They emit a cozy glow that helps you settle in on a quiet night or provide some extra lighting while reading a book. Floor lanterns are an option, too. Use them with taper candles to brighten a dark corner of the deck or group them near the door. What’s even better? Lanterns and hurricanes add to your decor during the daytime hours, too. They spruce up your outdoor space with sophisticated designs and classic appeal. 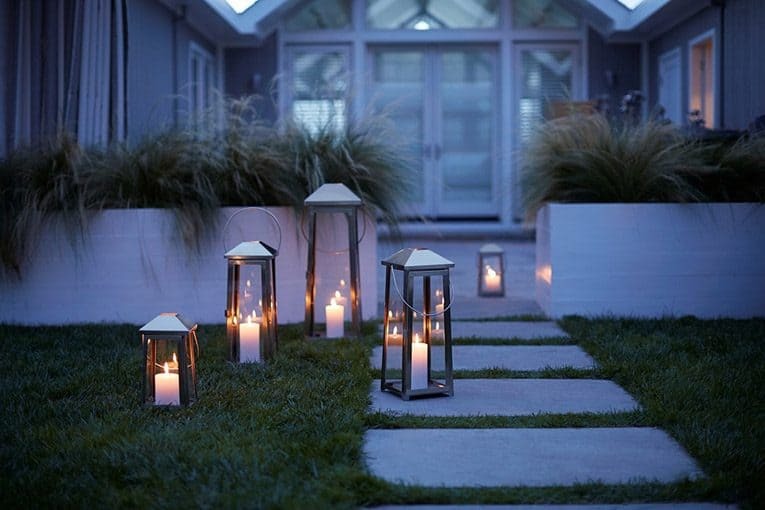 Candles in protective glass lanterns can light a side path in a yard. Speaking of candles, they make for ideal outdoor lighting on a calm day. Whether placed in a lantern near the patio door or situated in a small glass holder, they do their part to enhance the ambiance. On the veranda, light a scented candle to help relax after a long day or add the final touch to a formal outdoor meal with a candelabra. Keep it casual with tea lights in clear jars strung along the fence. Looking for a creative way to line a walkway? Use votives in ceramic holders to guide the way. To make your deck feel more like an indoor dining room, consider the addition of pendant lights. They’re the natural choice to hang above the table, whether hosting a dinner party or enjoying the fresh air alone. Maintain the fluidity of your home’s modern chic appeal with a classic black pendant light or keep it rustic with one that has a woven shade. For formal events, consider bringing your sophisticated style to a porch with a chandelier. Make sure it’s weather resistant or under a covered porch. If you’re feeling creative, hang a chandelier from the sturdy branches of a tall tree. To light beneath low overhangs, consider flush mounts as an alternative. They won’t get in the way and will stay put in the wind. 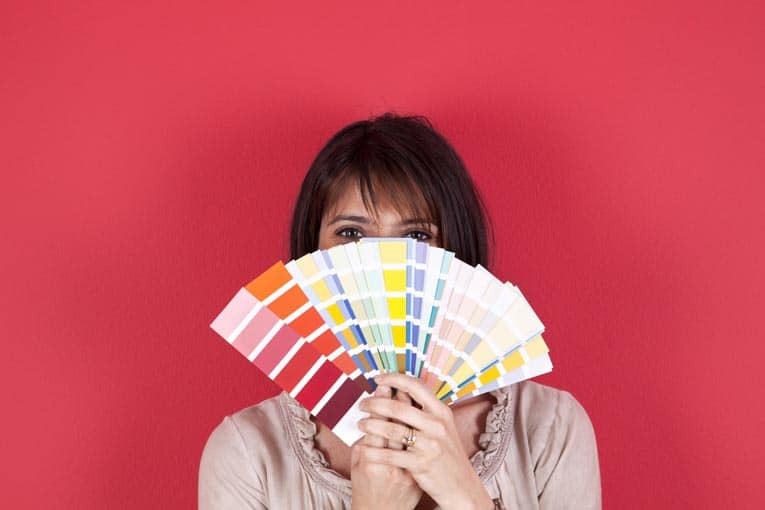 Looking to draw attention to unexpected areas? Hang a pendant light over the lounge furniture or buffet table on the deck. 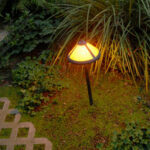 Low-voltage outdoor lighting highlights garden areas. For homeowners who believe safety is first priority, install a series of path lights along your walkway. Solar stake lights are a convenient solution, as they turn on automatically and stay in place. For a subtle look, opt for small lights that blend in with the walkway. Don’t have a path but enjoy the subtle glow? 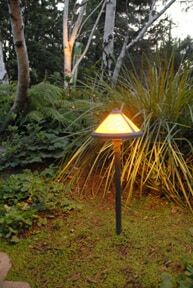 Line path lights along the edge of your backyard pond or around your growing garden. Path lights can be used in the driveway, too. Bright LEDs effortlessly guide you to the garage after dark. What About Bulb Size and Color? String lights can transform your backyard into any type of scene. If you’re shooting for an intimate mood, opt for strands with small bulbs that stay in the background. For parties with loud music, dancing and karaoke, consider string lights with bigger bulbs. They can make a statement throughout the event and add to the lively atmosphere. When it comes to colors, consider white for everyday events and multicolor for the holidays. Celebrate each season with shaped bulbs that range from halogen pineapples at a summer luau to fluorescent hearts during Valentine’s Day. Make sure each bulb is approved for outdoor use. This also rings true if it’s under a covered porch, as the ceiling can become cold and wet. Most installation requires a professional. Hire an experienced electrician to make sure all the I’s are dotted and the T’s are crossed. For lights in hard-to-reach spaces, consider investing in bulbs with an extended lifespan. This minimizes how often you’ll be climbing ladders and moving furniture. 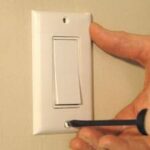 Provide each outdoor outlet with a cover and make sure the plug is protected as well. With these tips in mind, shed a little light, and enjoy your space!